After making that baghali polo, I still had about two cups of cooked lima beans to use up in the refrigerator. 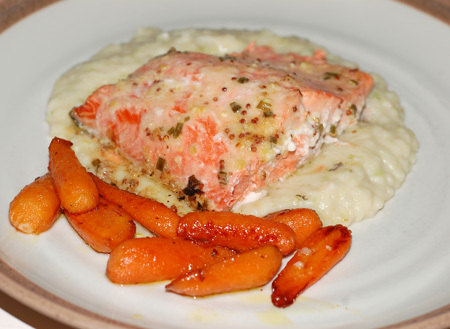 I decided to make it into a simple puree to serve with wild salmon and glazed carrots. While the salmon baked with a little flavored butter—I used a combination of lemon, coarse mustard, and chives—I sauteed a leek until tender, then added about 1/3 C of chicken stock and the beans, and let it all heat up under cover. When the salmon was done, I pureed the bean mixture and added a few healthy dollops of plain yogurt, stirred it all up, and adjusted seasonings with a liberal pinch of salt. My puree of formerly dried beans did not achieve that wasabi-green look you could attain with the frozen variety, even with the assistance of the leek, but it was creamy and smooth with a slight yogurt tang that echoed the lemon in the salmon, and it made an excellent alternative to mashed potatoes. I would hardly have guessed it was made from lima beans. And the leftovers made a tasty cold spread for slices of bread or a dip for carrot sticks. This was only my second successful attempt to cook with dried beans, and it has entirely transformed my opinion of lima beans. I think I was just using really old beans in the past, since they always maintained a mealy, gritty texture even after hours of cooking. This result makes me even more excited to work with other varieties of dried beans, especially now that I know I’ll use them in a timely fashion—and even the effect that the limas had on a certain family member several hours later didn’t dampen my enthusiasm. In a saucepan, melt butter and saute leek over medium heat with a pinch of salt until tender; add chicken stock and lima beans, cover, and heat through. Puree bean mixture in a food processor or use an immersion blender; the mixture should be very smooth and about the thickness of mashed potatoes (if too thick, add more chicken stock; if too thin, return to the heat and simmer until desired thickness is attained). Stir in the yogurt, taste, and adjust for seasoning—I added a good teaspoon of salt, as my cooked beans had not yet been seasoned. Serve with chicken, pork, or fish; or as a dip for vegetables or spread for slices of artisan bread.